22 december 2018: Zo, dat weten we ook weer. Crystal Island in Moskou komt er definitief niet. Het immense project heeft de plannen fase niet overleefd. 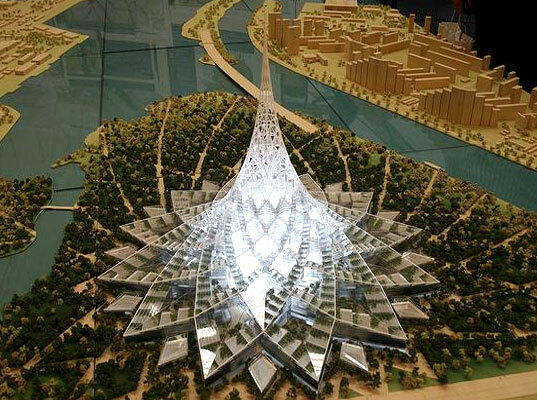 Crystal Island was a proposed mixed-use building in Moscow, Russia. It would have the height of 450 metres | 1,476 ft. It will contain 900 units of apartments and 3,000 hotel rooms. It would be the largest structure on earth if it was built. The architectural firm behind the design is Foster and Partners. The building would form a breathable “second skin” and thermal buffer for the main building, shielding the interior spaces from Moscow’s weather. This section skin will be sealed in winter to minimize heat loss and opened in the summer to naturally cool the interior. The building would be integrated into a new park, which would provide a range of activities throughout the year with cross country skiing and ice skating in the winter. The building is stated to have a multitude of cultural, exhibition, performance, hotel, apartment, retail, office space as well as an international school for 500 students. The building would be powered by built in solar panels and wind turbines. The structure would also feature on-site renewable and low-carbon energy generation. In 2009, financial backing for the project was lost due to the global economic crisis and construction of the project was postponed. 4 januari 2008: Ook in Rusland kan men natuurlijk niet achterblijven in de wedren naar het grootste, het hoogste, het meest energiezuinige dan wel het meest ecologische gebouw ter wereld. this is a beautiful design. i would love to visit.